My colleague Katie handed over the cookbook with an apology: “Sorry, some of the pages are stained.” No need to apologize for that, I assured her. Cookbooks with stained pages are evidence of frequent, loving use. The cookbook in question does indeed come with love. 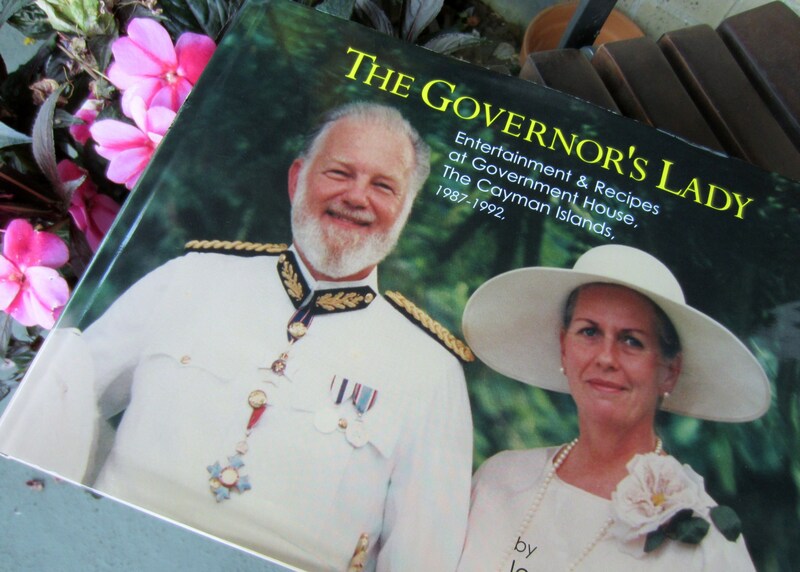 The Governor’s Lady: Entertainment & Recipes at Government House, The Cayman Islands, 1987-1992, was written by Katie’s grandmother, Joan Hall Scott, whose husband served as the last British Colonial Service Governor of the Caymans. I expected a collection of traditional Cayman and British menus, which are there. But The Governor’s Lady is more a story of its author’s own lifelong pursuit of new cuisines and new cultures. She studied anthropology, and lived in Morocco, Fiji, Hong Kong, Japan, Italy and Provence, before settling recently in England. The presentation of her recipes, with a side of wry social commentary, gives me a new appreciation for cooking as an anthropological endeavor. I’ve never met Katie’s grandmother. But judging from her cookbook, I think we’d get along splendidly She too, became curious about different cuisines and cultures at an early age, in opposition to her staid and rather unimaginative upbringing, in Philadelphia. (Her first chapter, “Genesis of a Passionate Cook” really rang a bell.) And her culinary explorations mirror my own in an astounding way. I know well and have tried variations on many of the recipes in The Governor’s Lady — from Turkish Red Lentil and Mint Soup to Normandy Pork (doused in Calvados and cream) to Rogan Josh from Northern India. In fact, given that I’ve picked up many of them not from my own travels, but through the globe-trotting ways of my compatriots Kate and Robin. Ms. Scott could become an honorary member of the Three Point Kitchen without even trying. Sad to say, there’s not much chance of trying one of the recipes that most exemplifies the Caymans — Turtle Soup— without some serious work tracking down the main ingredient. But turning to page 127 of this slim volume lands us on Caymanian Baked Fish, a lovely dish for entertaining that the author recommends serving with Spiced Sweet Potatoes (true to form, The Governor’s Lady prefers savory sweet potatoes, just like me) or Braised Yellow Squash and Bacon (like Kate and Robin, she is not afraid to douse things in bacon). Next Post Key Lime Pie, Anyone?